Findlay Foods Info Article: Wow Them! "The customer experience" is so important for repeat business and word of mouth advertising. You can settle for a satisfied customer who will come in once a month or a "wowed customer"
who will think of you and return the next time they decide to eat out. There are 7.3 million visits to restaurants daily in Ontario. People are eating out...but are they coming back to your place? Ordinary acts that you do everyday can be made extraordinary with a little thought. and make them want to come back. Big smile..."We have been expecting your Mr. and Mrs. Powell, I have reserved your favorite table for you! or "So glad to see you again Paul, since you said you might be in town today, I asked the chef to prepare your favorite soup!" Create a memorable experience (something that makes them feel special and noticed). Pull out their chair, offer to hang their coat or open their menu for them, remember their name. If they are first time guests, let the owner/manager know so they can introduce themselves and invite them back! Come over with their usual drink order, without them having to order it. Extend a compliment, notice it they had a hair cut or if they are wearing something out of the ordinary. Offer complimentary newspapers in the morning for your customers to read. Invite them back! (a reason to return) - Personally invite your guests back to see you. Rub granulated garlic, oregano, pepper and salt on pork brochette. Put in a plastic bag and pour Italian dressing over pork brochette to coat evenly. Seal bag and refrigerate overnight. On a 375 F grill, place pork brochette and grill for 9-12 min turning every 3 minutes. Meanwhile warm up pita bread, 2 minutes before brochette is ready. Lay pita flat, layer lettuce, white onions, tomatoes and tzatziki sauce. 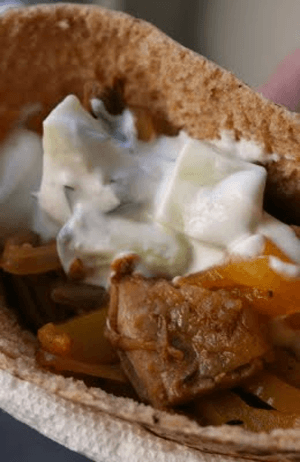 Remove pork from skewer and place meat carefully on tzatziki. Fold pita bread securing with a tooth pick. Serve with a side Greek salad.